I’m an engineer that has been working in the field for over 23 years. For 9 years, I’ve been running my own engineering company, NS Engineering. I work with clients of all sizes. Everything from large Class B New York stations, to little LPFMs situated almost 150 miles out of the city – I find solutions for them all. As of right now, I have more than 70 Comrex units in the field, employed as everything from STLs to remote ENG. BRIC-Link II codecs make up a big portion of that number. I find that they make for a budget-friendly reliable STL for stations of all sizes. WQPH is a Catholic radio station serving the area of Fitchburg, MA. It’s a 3000 watt nonprofit station with a limited budget. They wanted to create an avenue to stream their station online. From my experience with BRIC-Link II, I know it’s very easy to configure it as a streaming server. It didn’t take me long to set up, and they’ve been using it with no issue for several years now. I also use BRIC-Link II as a private streaming server for confidence monitoring. For customers who already own BRIC-Link IIs, it’s easy for me to configure it such that station staff and myself can listen to a private stream and determine whether everything is working correctly. It’s saved me many trips to transmitter sites, and it makes it much easier to find problems before they become big issues. 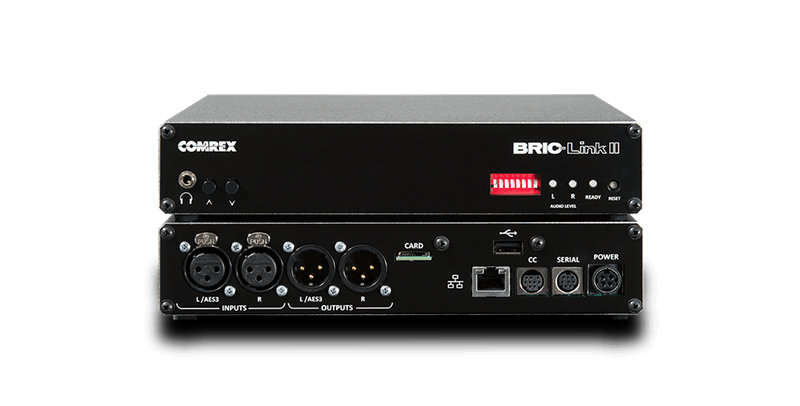 I believe the ideal user for BRIC-Link II as a streaming server would be someone who wanted to have complete control over their stream, and just wanted a simple, easy-to-use box that you plug in and use. There are many inexpensive streaming services, but BRIC-Link II just works. I know that once I install a BRIC-Link II, it’ll sit there and run for the foreseeable future, and I won’t have to worry about it. Learn how BRIC-Link II can help your station!